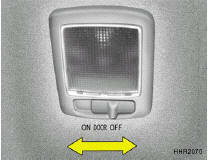 Luggage compartment light has a 3-position switch. The three positions are: o In the "DOOR" position, the luggage compartment light comes on when the tail gate is opened, then goes out when it is closed. o In the "ON" position, the light stays on at all times. o In the "OFF" position, the light stays off at all times.